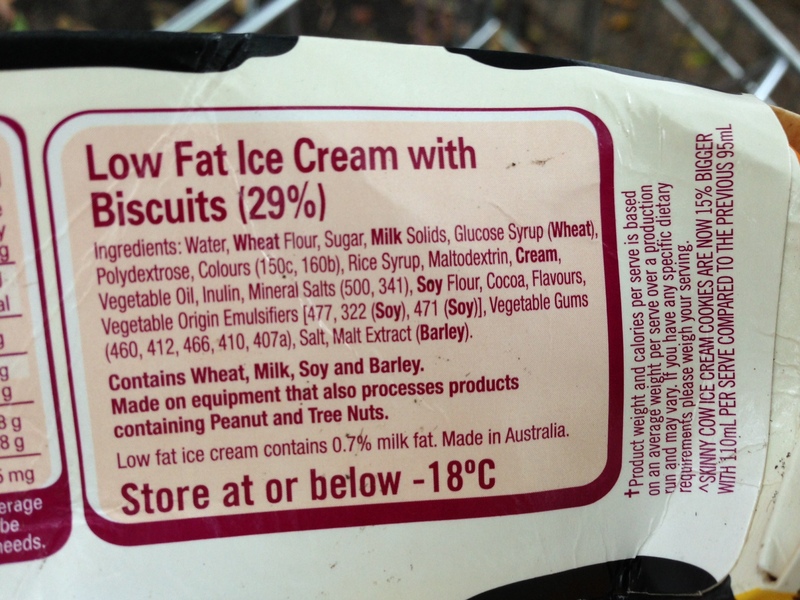 There’s WHAT in my ‘low fat’ snack!? I don’t believe that fat is the enemy as a general term. 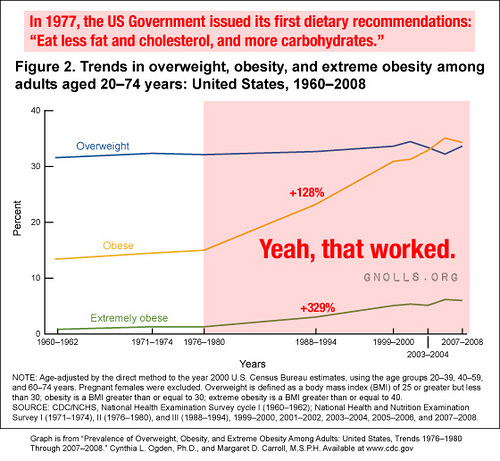 The graph above shows what happened in the US when low fat came into popular thinking and government backing in the mid 70s, and the rise in obesity levels. You should see the rise in diabetes and insulin dependence from that same time. They’re even worse. To make things taste good, lots of trans fats were used (because saturated became all of a sudden the bad guy) and loads of sugar, to still make things taste appealing. Other things added were a host of gels, thickeners, preservatives and additives of many kinds. It excites me no end, to see literature being published by many doctors speaking against this doctrine and saying ‘hey, we were wrong. we have to get back to real food and healthy sourced saturated fats are a part of that.’ A great article came out on that today, in fact. Check it out here. Quality fats are awesome. They’re great for keeping our blood sugar levels smooth sailing, feeding our brains, providing steady burning fuel and, contrary to main stream thinking over the past few decades, are wonderful for disease prevention. Hydrogenated oils, excess polyunsaturated oils (omega 6 rich) and oils that are fragile such as olive oil / most nut oils when heated, therefore damaged – These are the oils to avoid (Note: Olive oil is only not so great when heated, cold and drizzled is fine as a part of the healthy fats mix). They promote inflammation over time, which is the number 1 disease marker. If you ever want to completely geek out on the subject of fats, Dr Mary Enig has an amazing book. Know your fats. I loved it – might be a minority in thinking so, but a real page turner! Fat from grass fed cows in the form of butter and ghee is great for cooking, ghee being particularly stable when heated. Fat from Macadamia Oil is awesome. Fat from coconuts. Yep yep yipee! Fat from eggs, wild salmon and pasture raised pig and chooks, fed natural GM free diets – Yes, yes yes! Fat from pure cold pressed extra virgin olive oil, drizzled cold – Amazing! These beautiful foods (provided you eat animal products of course) should definitely get a daily look in, in some form, into your food mix along with inspiring bucket loads of real food of all kinds! A funny thing happens when you allow quality fats back into the mix. You eat less. A lot less. Your wrinkles diminish significantly. Your hair and nails have a beautiful health and shine – supplement free! The worst thing of all to come out of the low fat movement, was the additives that it brought about, as commercial recipe makers scrambled to create the same textures, but without the fat. 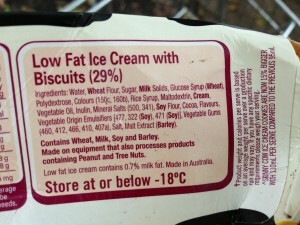 Check out this shocking snack I found in the trolley outside my house on the weekend. A great example. I posted it on facebook, as I often tend to when I find something that’s going to help the new and curious, get into the real food way of life. Once you know what these things are, you just can’t buy them again. What I particularly loved, was that a newbie asked for clarification and a brief explanation as to why this was so bad. I decided to write out the whole thing, and boy – it took a while. I thought I’d share it here too, so here goes. A list of what everything in this ingredient list and what it means. The ‘numbers’ information comes from a fantastic app: Chemical Maze. 150C – A food colour linked to hyperactivity, gastrointestinal problems and liver weakness. 160b is another colour – annatto, another shocker: headaches, hyperactivity, sleep disturbance and hives, also often GMO sourced. 500, while not dangerous like the other two, can cause gastro problems if eaten too much. 341, while not dangerous, is an antinutrient and can prevent nutrients from being absorbed. 477 is propylene glygol, often GMO and used in skin care and soap. 322 is soy lecithin and often GMO, can cause hyper sensitive reactions. 471 is a mono dyglyceride, and while no known adverse effects, it’s most often GMO derived, which means we have no long term data yet. 460 comes from wood or cotton pulp and is an anti caking agent. Often used in toothpaste and lipstick and can cause gastrointestinal ailments. Eating wood pulp!?!? 412 can cause adverse gastro intenstinal reaction in gluten intolerant people, especially babies. 466 also comes from wood pulp which is then chemically modified – potentially causes gastrointestinal and liver problems. Mmm, there’s that chemically modified wood pulp again! 410 is a thickener and while reactions are rare, excess amounts can cause lots of gas. 407a is a carrageenan and can cause asthma and is banned in infant foods…. Ok that’s the numbers. Now, the other stuff. Wheat is sadly not the wheat of our grandparent’s time. It’s a hybrid and super, super hard for our bodies to digest. Wheat Belly is a great read, if you want more details on that. If you’re going to use flours, spelt, kamut, buckwheat and rice flours are much kinder options on the body and you can still make super delicious things. Polydextrose is an indigestible synthetic polymer of glucose – doesn’t that just sound delicious!? Inulin is a faux healthy ‘fibre adder’ marketed and popped into lots of packet foods, and comes from the fructan family. It can therefore cause methanogenic bacteria to grow in the intestines if one is sensitive to them. Basically, lots of super stinky farts – why not tell it like it is?! Maltodextrin is processed starch. Very bad for blood sugar. Milk solids are the powder left from removing all the moisture from milk and used in lots of tasty cheese, yoghurts, compound chocolate bars and ice cream. The problem is that this process oxidises cholesterol, and many scientists believe that it is this oxidised cholesterol, not the fresh natural cholesterol in eggs, butter etc, that is one of the contributors to heart risk. Rice syrup is made by fermenting brown rice and breaking the starches into a syrup that is glucose based. One of best sweeteners to use in baking when trying to use less sugar because while fructose all gets processed through the liver, glucose gets used and processed by several parts of the body. There is some backlash against rice syrup and arsenic levels over the past few years. I’m still making up my mind, and don’t believe that the odd recipe with rice syrup is going to harm us. Whew. So there are the ingredients. All of the details of the numbers comes courtesy of Chemical Maze – an amazing app where you can punch anything in and it will tell you the risk / non risk of all the numbers as known from current studies and testing. All of this basically made me hop into the kitchen to make us a delicious version: A vanilla bean ice cream sandwich. A great project for a rainy afternoon! Check it out here. It’s not for you or anyone to feel guilty about having enjoyed or purchased these sorts of things in the past, or even yesterday. It’s about thinking, wow. I now have the power of knowledge. I now can help tell my friends that this isn’t cool. We were lied to with packets and promises and now that we know, we can make our way into the Real Food life. It’s a beautiful life indeed.